In their second offer on PrimeStox they are funding Christmas orders of award-winning jams, jellies and chutneys. Paid back in full on 8 Feb 19 1 day early!!! 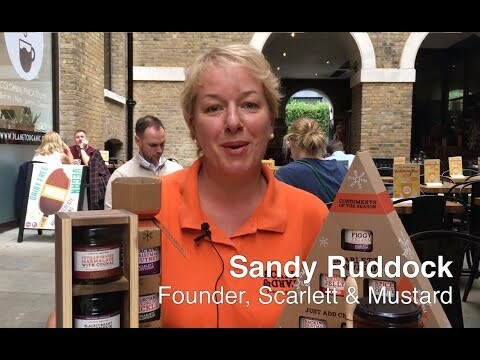 Founded in 2012, much-loved Scarlett & Mustard has become a fixture among British independent fine food producers. Founder Sandy Ruddock is now funding the production of 50,000 jars of their award-winning jams, chutneys and relishes. These are Christmas orders. The company is raising £37,500 and is offering to pay back in 6 months plus 5.8% profit. PRIME investors can earn 6.3%. That's an annual equivalent rate of up to 13.0%. You'll also become a Friend of the brand. Scarlett & Mustard is Back successfully raised £37,500 to fund the production of 50,000 jars 260 days ago. Check back soon for more offers. Scarlett & Mustard's first offer on PrimeStox launched almost exactly one year ago. The offer repaid on time and in full. Founder Sandy Ruddock says "The line is going really well and we are still supplying it." Scarlett & Mustard was founded 6 years ago and is itself a staple in the British fine food community. They have won 26 Great Taste Awards with 6 new awards gained in 2017. This includes 3 awards for the Christmas jellies and jams. Scarlett & Mustard are preparing for their busiest part of the year. They have received Christmas orders for 50,000 jars of their jams, chutneys and jellies. These will be sold in special gift packs or in separate units to hamper companies. Hamper companies are an important client of Scarlett & Mustard. Each may buy between 2,000 and 10,000 jars. The company made sales of approximately £500k in 2017 and is expecting to grow by 20% in 2018. Now Scarlett & Mustard are raising £37,500 to fund the production of 50,000 jars and they are asking for your support. Scarlett & Mustard make their own products and the funds will be spent on ingredients, labour and their unique packaging. In return they are offering to repay in 6 months plus 5.8% profit for Standard investors and 6.3% PRIME. That's an annual equivalent rate of 12.0% Standard and 13.0% PRIME. You'll also become a Friend of the brand.